The International Virtual Assistants Association (IVAA) is a non-profit organization dedicated to the professional education and development of members of the Virtual Assistance profession, and to educating the public on the role and function of the Virtual Assistant. 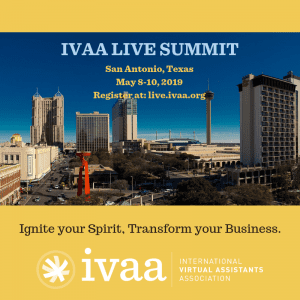 IVAA provides continuing education, networking opportunities, member benefits, as well as providing a member directory and Request for Proposal (RFP) system for parties interested in utilizing the services of member virtual assistants. Virtual assistants are independent contractors who (from a remote location, usually their home or office) support multiple clients in a variety of industries by providing administrative, creative, and technical services. Not sure exactly how a Virtual Assistant can support you? Check out “101 Ways to Use a Virtual Assistant” for ideas. And have an instant support system to help you navigate the ups and downs of your chosen field? Get all this and more when you join IVAA. Looking for a Virtual Assistant? Are you in need of some specialized or occasional assistance to grow your business? Working with a virtual assistant can be the perfect solution when you need ongoing help (but don’t need a full-time employee) or when you need a specialist for an important project or two. From general administrative support to creative and technical projects, search our member directory or submit your own Request for Proposal (RFP) to find the perfect match for your needs. Click here to learn more about our live and in person conference for virtual assistants this May! Copyright © 2018 IVAA. "International Virtual Assistants Association" is a trademark of the International Virtual Assistants Association. All other trademarks and copyrights on this page are owned by their respective owners.